Online learning site Udemy, which offers classes on a wide range of subjects including programming, photography, Photoshop, writing, and more, is today debuting a new iOS 9 Developer Course that aims to teach students how to use Xcode 7 and Swift 2 to make iOS apps. Designed to be a comprehensive tutorial on app development for iOS 9 for complete beginners, the course includes a total of 28 hours of video lectures that cover topics like the Swift language, Xcode, SpriteKit, Inputs, Buttons, Reactive Interfaces, Navigation, Storage, Live Content, Images, Accelerometers, Motion Feedback, iAds, In-App purchases, and tons more. Udemy promises that by the end of the course, students will be able to build "clones" of popular apps like Uber, Tinder, Flappy Bird, and Instagram. The program also includes unlimited web hosting for 1 year, an eBook on earning money while learning to code, and over 1,000 graphic assets to use within apps. The Complete iOS 9 Developer Course is THE most comprehensive, pocket-friendly and profitable app development course you'll find on the web - or your money back. It's got EVERYTHING you need to start creating real, marketable apps that capture people's attention, gets them downloading and ultimately - make you money! It couldn't be easier. Even if you're starting from zero, you'll breeze through - from beginner to boss app developer - in just six weeks. Already know how to code? Fantastic. Now you can turn up the volume. In just six super-quick weeks, you'll go from good to great -app developer to VIRTUOSO-GENIUS! 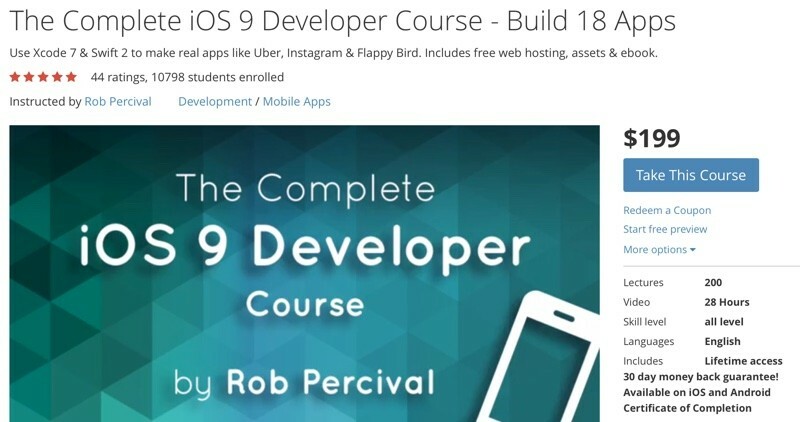 Udemy's iOS 9 course is the followup to the iOS 8 course, which saw more than 100,000 students enroll and received a 4.8/5 rating from attendees. The course continues to be taught by Rob Percival, who taught the iOS 8 course. Udemy's Complete iOS 9 Developer Course is priced at $199, but Udemy has agreed to give interested MacRumors readers a significant discount, cutting the price by 87 percent. When checking out, MacRumors readers can enter the code MACRUMORS to get access to the course for $24. The deal will last until the end of the day on August 4. For an even deeper discount, use coupon code TECHB10. Costs only $10 now. I think this code is only good for Jul 30. Well, I just bought it with another promo code for €11... So I don't think anyone pays the full price. Okay, the coupon code is updated and working. For those of you who got the expired message, give it another try now. Coupon code has 'sold out' already??? Bummer! Does anyone know anything about these guys? That's pretty tempting if it's actually any good. code has expired already? Seems strange to expire within 7 minutes of posting the article. I would have signed up immediately. Now I just have to unsubscribe from Udemy emails. MacRumors...can you help us out? coupon code 'MACRUMORS' appears to already be expired, and it doesn't appear to be August 4th yet according to my calendar. Tried using the code and . . . much as the rest have said, code is expired? Hang tight, guys. I'm emailing Udemy right now to get this worked out. Code is supposed to be active and unlimited. I don't think macrumors will be too pleased that we aren't using their promotion and somewhat hijacking the thread to promote a better discount lol. Thank You So Much. I actually feel a little bad right now as if I stole something lol. At $10 this is a bit too good to be true. Udemy is all about setting a super high price so they then can go around proclaiming handout-level discounts. The trick is older than prostitution probably.